January 21 2010 Maize Milling in the Twenty First Century. Between 1885 and 1895, a number of milling engineers laid claim to inventing the prototype plansifter. 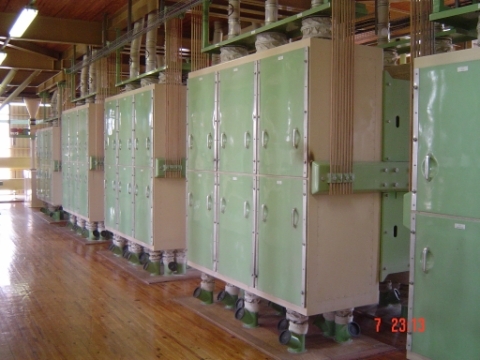 The event of the application of double high rollermills around the late 1980's, considerably reduced the building footprint per ton, of modern flour mills. The introduction of the giant plansifter had the same effect on the plansifter floor. The Nett surface on a giant ten section plansifter can be as high as 100 m² Nett sieving surface, depending on the maximum application of wide sieve frames and approx 25 sieves per section. In one section, it's possible to have four sieve groups utilizing wide sieve frames from top to bottom. It is possible to have a fifth group of sieves in a particular section but only four can have wide frames with the last group being normal sieve frames. There are small differences between one manufacturer and another. The vast majority of plansifters run at 240 rpm to 250 rpm, with a circle of gyration of approx 62 to 65 mm diameter. Research has shown that certain mill stocks sieve better at different speeds , but on average the above speed and circles of gyration give the best result for the range of mill products. One of the few situations where a larger diameter of gyration of approx 70 to 75 mm and a lower speed of 200-220 rpm can be applied is for the grading of degerminator overtail stock in maize mills. This situation only applies in large capacity mills, where a complete 2,4,6, or 8 section plansifter can be totally dedicated for grading duties. To all of the above there are special circumstances where plansifters can run at higher speeds. Too high a centrifugal force could overcome the force of gravity. Excessive centrifugal forces would also put strain on various machines parts.When plansifters run at 240 rpm with a circle of 63 mm, the resultant centrifugal acceleration comes up to a value of 20 m/sec². Suspension height normally results in cane lengths of 1900 to 2200 mm in most mills. 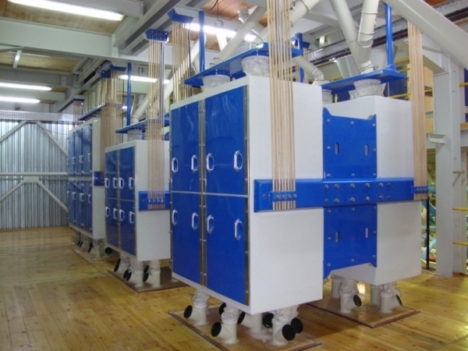 In mills that have cyclones mounted directly above the plansifter canes, cane lengths can be over 3000 mm. By comparison, a 1975 built mill with 300 tons capacity, had 6 X 6 section plansifters. Today a modern 300 tons per day flour mill, will have 1 X 10 section giant plansifter and 1 X 8 section giant plansifter. The maximum hourly capacity on one giant plansifter section on first/second break stock, is approx 7500 kg. The usual load is more likely 5000-6000 kg's per hour. Observing a row of plansifters stopping under a production or planned stop, is very useful. Normally plansifters will come to a stop in around 50 seconds totally and sway a bit for another minute or so. If any of the group of plansifters stops very quickly, it could indicate a worn bearing problem approaching. It is very useful to take an amp meter reading as a reference point of a plansifter motor when under load and running well. Typically the small size 6 section plansifter with 4 kW motor will draw 6.5 Amps under load. If this is seeing to be increasing towards 8 or 9 amps, it is an early warning of bearing problems. The above plansifter will draw approx 4 Amps running empty. Plansifters must always be started direct on line (DOL) so that the operating speed can be reached as quickly as possible. It is also desirable to pass as quickly as possible the critical speed of 20 to 30 rpm, where large undesired oscillation movements take place. In the run-out phase, when a plansifter is stopped below 20 rpm the sifter starts to make ever increasingly bigger circles of gyration, sometimes reaching as much as 200 mm and in the final stages this circle becomes an oscillation motion in uncontrolled directions. Plansifters should always be fitted with timers to prevent re-start. Over the years, our experience has shown that the revolutions cease at about 50 to 60 seconds after shut down and the sifter continues to have relatively small swaying movements for another 30 to 40 seconds. It is therefore good practice to set restart timers on a 3 minute setting. It is not good practice to install a hand operated isolator switch on a plansifter, where in the field, (PLC unidentified stops and starts) can be carried out by staff. It is also good practice to not only rely on software intervention in preventing sifter re-start, but also to have a parallel hardwired interlock. It is a very worthwhile exercise every six months to tension all bolts on the connections between cabinets and drive stations and on the main transverse bearers. Given the forces at play in a plansifter in motion, the slightest movement on connections, very quickly becomes exaggerated and can develop into structural problems. Running plansifters empty should be avoided, as it causes excessive wear and tear on sieve cleaning devices.